Are you adventurous and interested in seeing the world? Looking for ideas for a gap year? Or do you need a part-time job to help save money for college? Contract over-seas jobs conducting scientific research are a great idea to get paid and gain an intriguing addition to your resume. Antarctica is the coldest, driest, windiest place on Earth. Yet it is also one of the most pristine, making it ideal for scientific research. The National Science Foundation (NSF) manages the United States Antarctic Program (USAP) by funding hundreds of scientists to conduct research throughout the continent. Everything from atmospheric studies and astrophysics to glaciology and global climate change are studied there. That’s why the program needs hundreds of contract workers to provide logistical support for scientists. Sample jobs include housekeeping, electricians and pilots. You have to be 18 or older to apply. If qualified, you must then pass physical and dental exams, as well as clear a drug test and a background check. Positions are mainly filled between March and August.Living thereThere are three permanent U.S. stations in Antarctica, as well as numerous remote field camps and two research ships, The Polar Sea and the Polar Star. The largest station, McMurdo, is located under New Zealand. Employees work a minimum of 54 hours weekly (nine hour days, six days a week). This still leaves lots of time for extra-curricular activities. There are countless forms of entertainment and recreational activities to keep you busy. Check out the assorted sports, exercise equipment and safe cross-country skiing and hiking routes. A library, educational classes and science lectures are available. BenefitsOn top of a weekly salary, personnel are supplied with free room and board, health, dental and vision benefits. Transportation to and from Antarctica, as well as travel funds, are supplied. Why this idea for gap year? Valerie Carroll of the Raytheon Communications Department offers this bit of advice: “Experience and skills are necessary, but personality and attitude weigh heavily.”So, get out there and see the world! Make some money. And have the experience of a lifetime during your gap year! 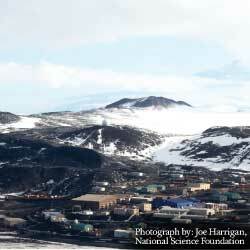 Information on the U.S. Antarctic Program is available at http://www.usap.gov. Kristin Malara worked at McMurdo Station, Antarctica.